Zhanna Arshanskaya Dawson escaped a death march by playing music. Atlanta (CNN) -- Zhanna Arshanskaya Dawson's name is etched on the wall of a stark underground memorial in Ukraine, next to that of her sister, Frina, their parents and grandparents. She was presumed dead, like the 16,000 other Jews from Kharkov who perished under the Nazis in the winter of 1941. Only, Dawson survived, as did her sister. They lived through the Holocaust, saved solely by their musical genius. Dawson's son Greg believes his mother and aunt are the only two Jewish survivors from Kharkov. He came upon their names at the memorial in 2006 when he visited Ukraine to write a book about his mother, "Hiding in the Spotlight." After the war, she made a successful life for herself as an accomplished pianist in the United States and had kept silent on her history for many years until her sons had grown up. Seeing her name came as a shock to Greg Dawson. He remembers his finger freezing upon the Russian lettering; shivers shooting up his spine. How narrowly she had escaped death, he realized. On this Friday evening, Greg Dawson, a writer for the Orlando Sentinel, is visiting his mother in Atlanta. The city's Oglethorpe University is honoring her Saturday with a doctor of letters. 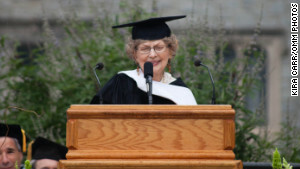 She will don a cap and gown and march down the aisle along with another honoree, CNN founder Ted Turner. It is recognition for a woman who played the piano in the vein of Vladimir Horowitz but with the modesty of an unknown. Recognition for a triumph of spirit amid the worst of humanity. Zhanna Dawson was selected for "her indomitable spirit, courage, honesty, and sense of purpose," says Oglethorpe Provost Denise von Herrmann. Dawson hangs up a pair of creamy yellow pants freshly dry-cleaned for the occasion. She is excited that finally, at a youthful 85, she will earn her first degree. War kept her from high school; marriage drew her away from the prestigious Juilliard School. But her love of music has always been with her. It has been more than a decade since she last put fingers to a keyboard. She developed carpal tunnel syndrome and when doctors told her that surgery could, at best, bring her strength back to 70%, she refused and decided at that moment to give up what she loved most in life. Eventually, when she no longer taught students she believed had potential, she disposed of the baby grand and upright that occupied a chunk of her condominium's living room, the space now occupied by glass-front cabinets bearing family photographs and mementos. None gives away the suffering she endured. She has nothing left of her past, save a handful of family photos given to her many years later by a relative, and the one thing she managed to rescue from her house when the Nazis stormed in. Dawson's love affair with the piano began when she was 5. A year later, she performed Bach's Invention Number 1 in public. Her father, Dimitri Arshansky, a candymaker by trade, ordered a shiny new Bechstein piano from Germany and encouraged both his daughters to study music at the local conservatory. A professor there introduced little Zhanna to Chopin's "Fantasy Impromptu." She was determined to perfect her playing of the piece. But life as she knew it stopped with World War II. The Nazis invaded Kharkov in 1941. Only 14 then, Dawson remembers seeing bodies of Jews hanging from lampposts. On a frigid December day, German soldiers stormed into the house at 48 Katsarskaya Street, rounded up her entire family and shoved them into a long line of Jews forced to march out of the city. It was the last time she saw her house. The only possession she was able to take with her was the sheet music sitting on her piano. "Fantasy Impromptu." "I couldn't have possibly left it," she says, thinking back to that wretched day. She didn't need the written notes to play it; she knew it by heart. But it had her teacher's scribbles on it. And it was her favorite piece of music. The Nazis forced Kharkov's Jews to walk 12 miles outside the city in the bitter cold and snow. Occasionally, a mother would push her young child toward the crowd watching the exodus, in hopes that someone would have sympathy and rescue the child. If her actions were detected, the Nazis shot her on the spot, Dawson remembers. Her family was taken to an abandoned tractor factory designed to hold 1,800 people. The Nazis forced 13,000 Jews into the barracks without warmth or food. Many people died there. "It was inhuman," she recalls in her son's book. "The sight of women the age of my mother and grandmother made me shake in shame for the Germans." The day after Christmas, the Jews were ordered to prepare for transportation. Dawson says her father knew they were all going to die when he saw the trucks go north. There was nothing to the north. It was a road to Dobritsky Yar, a road to the unthinkable. Dobritsky Yar had two giant pits like the ones at Babi Yar near the city of Kiev, where the Nazis killed 34,000 Jews in two days, most machine-gunned in the back. Dimitri Arshansky pulled out his gold pocketwatch and flashed it in front of a young Ukrainian guard. He told the guard his family wasn't Jewish; to please let his little girl go. Dawson received an honorary degree at Atlanta's Oglethorpe University on Saturday. Dawson says her father realized that he could not save both his girls -- two of them running would be too much commotion. He knew Zhanna, the adventurous, free-spirited one named after Joan of Arc, had a chance to survive. As the guard took the bribe and looked away, she fell out of line and ran like the wind. "I don't care what you do," her father told her. "Just live." A few days later Dawson was reunited with her sister. To this day she does not know how Frina escaped the death march. Frina has never spoken of it or about anything else from that time. Dawson believes her sister was too traumatized to talk about it. With the help of friends, the two girls made it to an orphanage and were able to obtain fake, non-Jewish identities. For the rest of the war, they were no longer their father's daughters. "My name is Anna Morozova. I am from Kharkov. My sister Marina and I are orphans. Our father was an officer on the Red Army and was killed in action. Our mother died in the bombing of Kharkov." Dawson said it so many times during the rest of the war that it echoed endlessly in her head. A piano tuner at the orphanage heard her play one day and offered her and Frina jobs with a musical troupe that entertained the Germans. It was a frightening prospect but Dawson kept thinking of her father's last words -- just live. They played for Nazi generals and in front of German audiences in the city of Kremenchug. Bach, Beethoven, Rachmaninoff, Liszt, Brahms, Chopin. Years later people asked her how she could have done what she did. Was it not like the musicians who played as Jews walked into gas chambers in the concentration camps? I was playing for the memory of my parents ... I was playing to survive. "I was playing for the memory of my parents," she says. "I was playing to survive." And her music, she says, was the only spot of beauty in that bleak atmosphere. Music provided a psychological cocoon. Without it, her spirits might have broken. There were moments when she feared they would be found out for who they really were and shot on the spot or sent to a gas chamber. One time, the German soldiers put the onus of proof that the girls were Jews on the people who ratted them out. "We were a precious commodity for the Germans," she said. "We were more valuable alive than dead." Months turned into years of hiding in plain view. When the Germans began retreating, they took the musical troupe with them, back to Berlin. There, the Jewish Arshanskaya girls walked past Gestapo headquarters and even Adolf Hitler's bunker after the Allied bombing began. When the war finally ended in 1945, they were taken to a displaced persons camp run by a young American officer, Larry Dawson, who had a passion for music. Dawson's brother David was an accomplished viola player. Larry Dawson arranged for a concert. Zhanna and Frina were to play for survivors of Dachau, the notorious concentration camp near Munich. 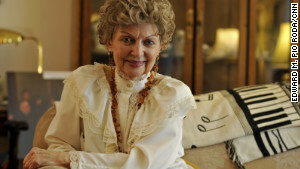 Zhanna Dawson remembers how nervous she was on the evening of April 13, 1946. After years of playing for the enemy, she was finally going to perform for her own people. "These were such special people." It has been more than a decade since Dawson last put fingers to a keyboard. In front of the stage at the Landsberg Yiddish Center, sat 1,200 Jews. They exploded with applause and bravos, even though Dawson knew that technically, it was the worst she had ever played. "This was a celebration," she says. "It was the only time I didn't care how I played. I thought again of what my father said. 'Just live.' Just play." Soon after, Larry Dawson put the Arshanskaya girls on the first U.S.-bound ship of refugees from Germany. They arrived at Manhattan's Pier 64 on May 21, 1946, to begin their lives anew. By then, Zhanna was 19; Frina, 17. Both won scholarships to The Juilliard School. Zhanna fell in love with David Dawson, married him and left Juilliard before finishing her degree to join him in Bloomington, Indiana. She began performing and teaching music at the university. She had two sons and raised them without ever uttering a word about her past. Greg Dawson had no idea that he was Jewish until he was grown up. His mother says she never spoke of surviving the Holocaust because she wanted her sons to experience normal, carefree childhoods. She didn't want to burden anyone. But in the spring of 1978, when Greg Dawson was working as a reporter at the Bloomington newspaper, NBC began airing a four-part miniseries called "Holocaust." Until then, many Americans knew little about one of the world's grimmest periods of history; perhaps they had read "The Diary of Anne Frank." Dawson wanted to write something for the newspaper and asked his mother to tell him more about her memories as a Russian who lived through the war. "What she gave me was a life and death story of epochal dimensions that left me in disbelief," Greg Dawson wrote. He was getting to know his mother all over again. In the 1990s, his daughter, Aimee, asked the same question of Zhanna Dawson. Aimee was 14 then, and for a school project, she wanted to know what her grandmother's life was like when she was that age. Zhanna Dawson penned an eloquent letter from Atlanta, where she had moved after her husband's death. After that, she began speaking publicly about her life and no longer kept secrets. Except one. She had lied about her date of birth all those years ago so that the orphanage would take her in -- Russian orphanages did not accept children over the age of 14. Instead of revealing her true birthday of April 1, 1927, Dawson had changed it to December 25. Her sons celebrated mom's birthday on Christmas day, until 12 years ago, when she came clean. "I thought it was an April Fool's joke at first," Greg Dawson says. "But I never changed the year," says Zhanna. And proud to share a birthday with pianist Sergei Rachmaninoff. She has recordings of her own concerts. And she loves to listen to music. She has expanded from classical to jazz and even popular piano music. Liberace, she says, can play like the best of them. She cannot stand to watch television or movies with violence. 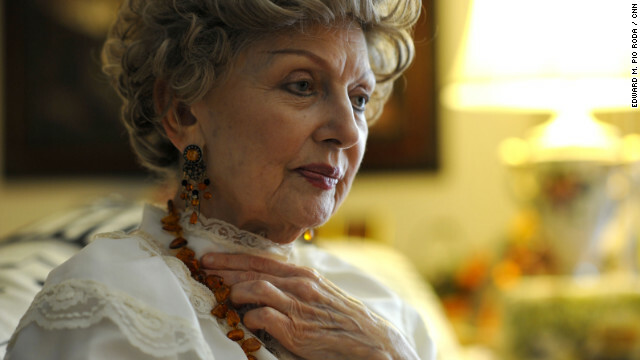 She has never seen any movies about the Holocaust, not even "Schindler's List" or "The Pianist," Roman Polanski's film about Polish musician Wladyslaw Szpilman's survival in the Warsaw Ghetto. Too painful to watch, Dawson says. However, she participated in The Shoah Victims' Names Recovery Project which aims to memorialize each Jew killed in the Holocaust by recording their names and stories. On her family's page are photographs of her mother, Sara, and father, Dmitri, and also of Prokofiy and Yevdokia Bogancha, the couple who helped Dawson and her sister after they escaped the death march. Now, she has another validation of her life and the music that saved her: an honorary university degree. She will keep it as she has the other pieces of paper that matter. The five sheets of music of Chopin's "Fantasy Impromptu" that she tucked under her clothes and survived with her. "How she preserved five sheets of music is beyond me," Greg Dawson says. "You know how perishable paper is." The sheet music was Zhanna Arshanskaya Dawson's treasure; it kept her going all those years when there was so little hope for survival. It is safely locked away now in a bank safety deposit box, something for newer generations of her family to look at -- and remember a survivor.